ThesesAssistDrawer, shorted as TAD, is a small, yet powerful tool that can help you configure the layout of your paper, thesis or science article. TAD features quick creating thesis template, quick inserting captions or cross-references for pictures, tables or equations, quick editing references, quick inserting footnote, smart recording document location, smart putting landscape pages in the middle of portrait pages, and quick placing multiple figures. TAD is compatible with 2007 or newer version of Microsoft Word. TAD enables you to manage (Add, Delete, or Apply) thesis template styles, and to create a thesis template with auto-numbered headings via a button click. TAD enables you to insert captions for figures, tables, or equations in a tick of time. The captions inserted by TAD can also be bilingual ones if “Bilingual” is checked in the settings. TAD enables you to insert cross-references to captions, headings, references, and pages with only a few clicks. With TAD running, you don’t have to open “Cross-reference” dialog box in Word to insert cross-references. TAD enables you to add or edit references in one of two ways: list paragraph and end note, and to merge consecutive cross-references to refs automatically. 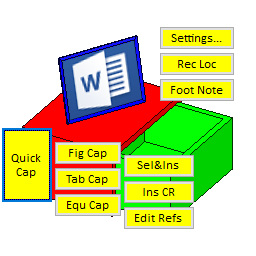 TAD enables you to insert foot-notes in Word with only a button click. TAD enables you to record the document location with only a button click. Besides, TAD can record the document location before cross-reference jumping, and jump back to the recorded location via a button click. TAD enables you to insert a landscape page in the middle of portrait pages, with the header and footer adjusted automatically. TAD enables you to layout 2 through 30 figures in one of two ways: shared caption and multi captions, and to easily adjust the size of the figures. TAD enables you to adjust figures size, and to scroll document location window-wise or page-wise via mouse wheeling. TAD enable you to execute shortcut keys command or complex keyboard operations via moving the mouse.